Here are the lucky winners. Love to read your blog and see what great ideas you have. Would love to win! Oh my goodness what a wonderful, wonderful giveaway. I would just love to have your new patterns. Please add my name to your drawing. Thanks so much! Will send out your packages this week. We feel very humbled by all of your kind words. We want to leave all of you with something to stitch while we are at market. The picture below shows the project. Barb stitched the small sampler in the hoop. The framed piece is the antique piece Barb found at an antique show this winter. She fell in love with the colors and the small size of the piece. I will have my husband upload the chart for you tonight. I thought it would make a great coin purse. A little zipper at the top. When you open your purse and pull it out ....everyone will want to know where you found it! Or stitch it into a small pillow...just the right size to tuck on a shelf. We will try to keep you posted at market. I make a lot of promises...but usually when we are working there is little time. My daughter will be there to help. She's pretty savvy about pictures and computers. I'll get her to lend a bit of help. As you are stitching this small piece, know that Barb and I are thinking of you. You know it is a game !! And even if we are very excited when propose such contest we are SO happy to participate. Like little children !! I find the little chart so cute ! Thank you to do this present to all of us ! I Will no doubt stitch it . Have a good time at market ! Thank you for the chart -- what a lovely little design! I'm looking forward to it! And congratulations to the winners! I actually know one of them! lol! Congrats to the winners!! They are very lucky ladies indeed. And thank you for thinking of all of us and giving us the chart! Can't wait to see the new things! Congrats to the lucky winners, and thank you for the sweet little chart to work on while we are awaiting your new publications. (Thanks also to your husband for facilitating our "habit.") And both you and Barb deserve all the nice comments, as your designs make stitching and acquiring a stash so much fun. Thanks for the future project I will stitch! Congratulations to the VERY lucky winners! I look forward to this very pretty little chart! I think I recall seeing it in some pictures you've posted recently, and being so enchanted by the colours! Thank you for your generosity, and please have a good trip to market! Lovely colours! Looking forward to stitching the chart. Hope you have a wonderful trip to market. Wish I were going! Oh, phooey! I was absent for too long from my computer and missed the contest. But I'm thrilled at the prospect of a fun little free chart. Thanks so much. Have a safe trip and thanks for the little goodie -- great colors and sweet so little. Congrats to the lucky winners. Thanks for the chart, I can't wait to get busy on it. You gals are the best! Congratulations to the Winners! I can't wait to get my hands on these lovely designs. Alma, I love that you two have started a blog. I really enjoy seeing what you both are up to and also enjoy the pictures. You take such wonderful pictures and the vignettes are so fresh looking. I just want to create a book with your vignettes as a coffee table book that I could cuddle up and dream away of having a home with this wonderful decor. We are getting ready to move back to the States soon, and I hope that I can catch a class with you two and get to finally meet you in person. Wow, I am so delighted to be the recipient of one of your giveaways - what a wonderful, generous gift! I love the new chart and can't wait to have a copy - I love the idea of a little purse. Have a great time at market! Congratulations to all the winners! I know that they're all going to be thrilled! And thanks so much, in advance, for the chart!! Hope you have safe travels to Market and i look forward to seeing the new designs. I am hooked! Congrats to the winners and thanks for the nice consolation prize! It is a cute design and I know I will enjoy stitching it! Thanks for the little chart! Lucky lucky winners - safe travels and best of luck at market! Safe travels to you and hope market is wonderful. I hope to see pics of all the fun! Thanks for the fun little chart - can't wait to start it! You both are so sweet! I hope you have a safe, healthy and happy trip and Thank you for the little sampler...it is adorable! Congrats to the lucky winners! 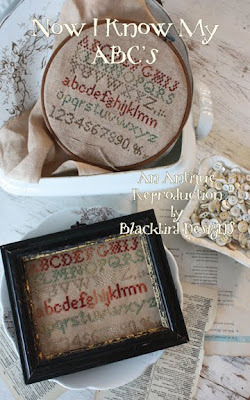 I look forward to stitching the sweet little alphabet sampler chart. Thanks for sharing it. YAY for the winners! And we'll all be winners with the upload of that chart! WAHOO! congrats to the winners! thanks so much for your generosity in sharing this chart with us .. it is darling and looking forward to seeing any pics or info from market! Alma- I love your designs- where will I be able to find the chart that your husband is going to upload? Thanks so very much for the chart...I love the design!! Have fun at market...I'm waiting to see all of your new delicious designs. Have FUN!! Congratulations to all the winners. Thank you for the wonderful sampler - it is just what I was wanting to do! How wonderful of you to think of us at home waiting patiently for the new book to arrive at our LNS/mailbox by gifting us with this design. congrats to the winners.. everyone is a winner with your gracious free pattern, have a good jounrey. Hi Alma, I have just recently returned to cross stitch after 20 years and what a thrilling surprise to find how things have changed! !......gorgeous patterns, hand dyed linens, fabulous threads of cotton and silk.... on and on! 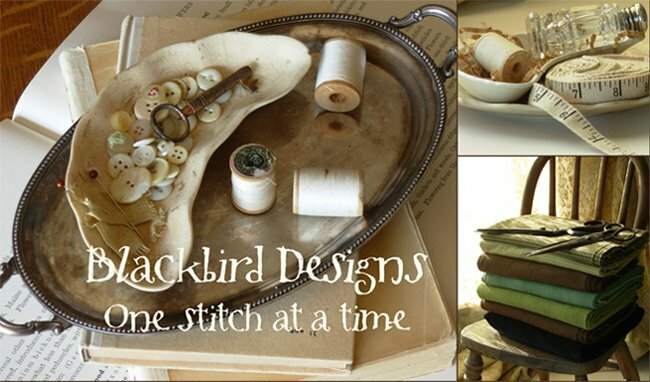 I find that most of the patterns I pick up and just must have are Blackbird Designs. What a trill and now I've found your blog and website. Thank you! Hope Market was fun!d I thank you! !